The Northerners really love to drink and that is actually an understatement. 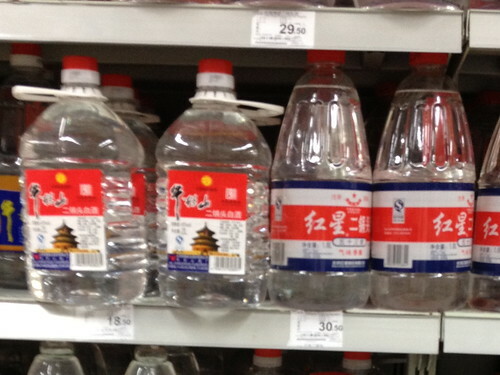 They have these Ch1nese spirits in the super market in 2-Litre plastic bottle and retailing, as you can see from the above picture somewhere in the region of RMB 20 to 30 (SGD 4.00 to 6.00), give or take a couple of RMBs. Plastic bottles probably because they can't recycle the glass bottles fast enough to be sold again. Yes, it is THAT scary. Mind you these are the heavy stuff with alcohol content above 50%. Northerners snub anything below 50%. I have tried these Er Guo Tous (二锅头) and I tell you, at around SGD 5.00 for a 2-Litre bottle, these stuff are really rough. Yet somehow, the locals drink them like a fish. I am both in shock and at the same time in awe. Gary: I am trained already but still scared of it whenever I see it in front of me.